The Boy Scouts of America is one of the nation’s largest youth development organizations. The Boy Scouts of America (BSA) provides a program for young people that builds character, trains them in the responsibilities of participating citizenship, and develops personal fitness. Since 1910, Scouting has helped mold future leaders by combining educational activities and lifelong values with fun. Through nearly a century of experience, the BSA help put youth puts on a path toward a more conscientious, responsible, and productive society. Boy Scout Troop 299, part of the Pacific Harbors Council is a religious, chartered organization sponsored and based out of Saint Patrick Catholic Church & School. Troop 299 is an official troop of the Boy Scouts of America, but Scouts in Troop 299 wear a green venturing scouts uniforms, inspired by its home at St. Pat’s. The scouting experience provides a fun way to learn about life as a citizen within a community as well as useful camping skills. The life skills learned in scouting are applicable to all areas of life. Troop 299 organizes monthly outings, ranging from day hikes to overnight campouts, and the troop attends a regional week-long summer camp where the focus is on building outdoor skills, earning merit badges, and participating in other scouting activities. Eagle Scout is the highest rank attainable in the Boy Scouting program of the Boy Scouts of America (BSA). A Scout who attains this rank is called an Eagle Scout or Eagle. Since its introduction in 1911, the Eagle Scout rank has been earned by more than two million young men. Requirements include earning at least 21 merit badges and demonstrating Scout Spirit through the Boy Scout Oath and Law, service, and leadership. This includes an extensive service project like the one undertaken by James Connelly in 2015, to install a life size statue of patron— Saint Patrick in a meditative garden on the church grounds. The Scout plans, organizes, leads, and manages the community service project. Eagle Scouts are presented with a medal and a badge that visibly recognizes the accomplishments of the Scout. Learn more about other Community Enhancement Projects completed and how the rank of Eagle Scout is presented at a Court of Honor Ceremony. Troop 299 meets on Mondays, 7:00 – 8:30 P.M. in the Church Hall at Saint Patrick Catholic Church. 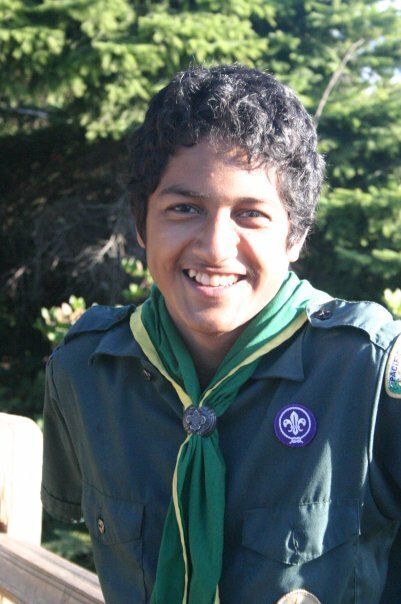 Boys age 11 – 18 are eligible for Boy Scouts. Boy Scout Troop 299 is a very active group. The Facebook album documents the scouts adventures in 2015/2016 program year— from snow shoe trips to hikes, from Adopt a Family to SlugFest.